How does one stay alive? This book asks the impossible question of how one maintains a separation between past and present, memory from self, and inheritance from present body. As objects and gestures from various chronologies collapse and conflate, as in dreams, one might then ask, what do our dreams tell us about our lives? Blurring the boundaries of fiction and nonfiction in a way that mirrors the attempt to capture what it is like to survive and to persist, How to Keep You Alive absorbs and sees the world through a lens of violence and trauma while struggling to maintain a present life in a body that continues to resist, to touch, to create rituals, to see, and to render the unseeable visually brilliant so the unsayable becomes a prayer. This book is that prayer. I’ve never read a book like this in my life and I love that so much I could scream. 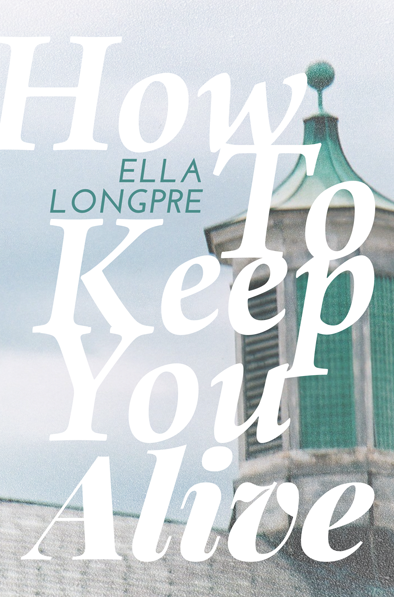 Ella Longpre’s How to Keep You Alive is a genre bomb love letter to identity dissolution and reformation. I think I held my breath a few times when I felt lyric language kissing the fact of a body, meanings coming apart but then reassembling kind of like the dance that creation and destruction make. Or, more precisely, when we go to tell the story of our lives and our bodies we find that what can be storied can be destoried and restoried. That’s the beauty and terror of memory meeting body meeting language. This storymaking will undo you in the best way, and restory you toward a difference you didn’t know lived in you. We could use that right now. It could save our lives. Reading Longpre is akin to entering a dream world in which one is called upon to utilize one’s investigatory powers, the domain of the poet, while simultaneously remaining still enough to let memory, prayer, lamentation and other forms of excessive language descend in tongues of fire. As if wrestling with angels, How to Keep You Alive joins battle with love, forgiveness, expiation and exorcism in a world where narrative untells itself as it spins a web that entangles and enmeshes everything from birth to grave. 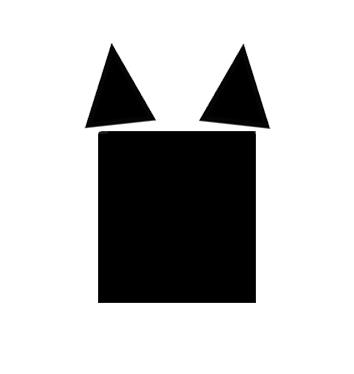 Formally, work engages kinetically with the page so as to compel a physically ocular engagement with the text, all the while accompanied by the steady thrumming of meditations on the idea of ruin. If “poetry is the practice of ruin” as Longpre writes, then ruin, noun and verb, has never appeared so imbued with possibility — of both life and death. – M. NOURBESE PHILIP, Author of Zong! Like a lucid past life learned of through aura photography, Ella Longpre’s exquisite fragmentation unearths the liminal locations that mediate our psychic being, mapping out a haunted pyramid-like map of what exists between the ephemeral and the timeless, technology and fiber, life and death. How To Keep You Alive indeed recovers a mystic, arcane air we by now need front and center more than ever. 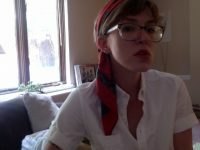 ELLA LONGPRE is the author of three chapbooks: Apocalune (The Lune 2016), an eponymous collection of poetry and essay (Awst Press 2015), and The Odor of the Hoax was Gone (Monkey Puzzle 2013). Her work has appeared or is forthcoming in the Volta, Deluge, elimae, Entropy, Fanzine, summer stock, A Bad Penny Review, Tract/Trace, &Now’s anthology of innovative fiction, and other locations. She has an MFA in Writing & Poetics from the Jack Kerouac School of Disembodied Poetics at Naropa University, where she was named the 2013 Anne Waldman Fellow, and where she is now an adjunct professor. She also works in the Writing Center at the University of Colorado Boulder, and has worked as editor at the Fanzine, Bombay Gin, Something on Paper, and other journals. Before working as a full-time writer, editor, and teacher, she worked at a college library in Western Massachusetts, where she also made and performed music. She is nothing without her chosen family and lives and writes in Colorado with her partner, where she studies erotics and disaster. She can be found in the woods.